11:15 Spain: Markit services PMI (Feb). 11:45 Italy: Markit services PMI (Feb). 11:50 France: Markit services PMI (Feb). 11:55 Germany: Markit services PMI (Feb). 12:00 Eurozone: Markit services PMI (Feb). 12:30 UK: Markit services PMI (Feb), FPC statement. 13:00 Eurozone: retail sales (Jan). 17:45 US: Markit services PMI (Feb). 18:00 US: ISM non-manufacturing PMI (Feb), new home sales (Dec). 18:35 UK: BoE Governor Carney’s speech. 22:00 US: monthly budget statement (Jan). My expectations of a trend line breakout were met in full. I think that the euro’s drop was a bit excessive given yesterday’s newsfeed. Today I expect to see an upwards correction on the euro. We may even see a new high in the near future. US President Donald Trump has renewed his criticism of Fed Chair Jerome Powell, saying that the US dollar is too strong, thereby hampering the US economy. I think that when the US and China sign a new trade deal, he will start making moves to weaken the dollar in order to make American businesses more profitable. 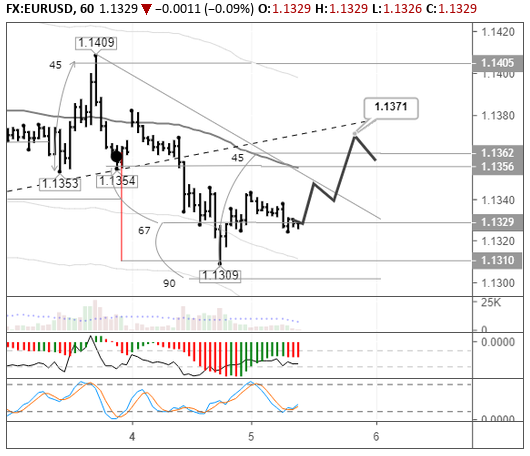 Today I expect the euro to recover to 1.1371. That’s what my pricing models predict. We’ll see today whether or not the bulls want to break through the LB line. The 1.1356 – 1.1362 range is providing resistance. The ECB meeting and NFP report will take centre stage this week.